One of the new digital tools being rolled out to services is a new case and contact management system. This is essential to improve how we manage customer contacts and reduce the cost of system support. Following an options appraisal comparing costs and features of many systems we have chosen a system called Verint Engagement Management for Government. Verint is the latest version of the Lagan Customer Relationship Management (CRM) system currently used by our Contact Centre and a number of other council services. We are currently in the process of upgrading from Lagan to Verint and the new system should be available to services currently using Lagan from July. If you don’t currently use Lagan but think this would be of interest to your service area, please get in touch. Verint provides staff with an easy to-use desktop dashboard that gives them access to multiple business applications, case management tools and all the information they require to handle customer interactions easily and efficiently. Having access to a wide variety of applications, legacy systems, business data and content repositories in one place reduces time-consuming application switching. Other council applications, such as the Booking System or Single View, can be embedded in the Verint dashboard. By default the Council website is embedded. A dynamic scripting feature guides staff through process steps providing the relevant information at each step while maintaining a helpful conversation with the customer. This supports the Assisted Digital offer provided by the Contact Centre and ensures staff give the same advice as is available to citizens online. The scripts also guide employees to help ensure regulatory and Service Level Agreement (SLA) compliance. Verint provides a 360-degree view of customer contact history across all communication channels and services. 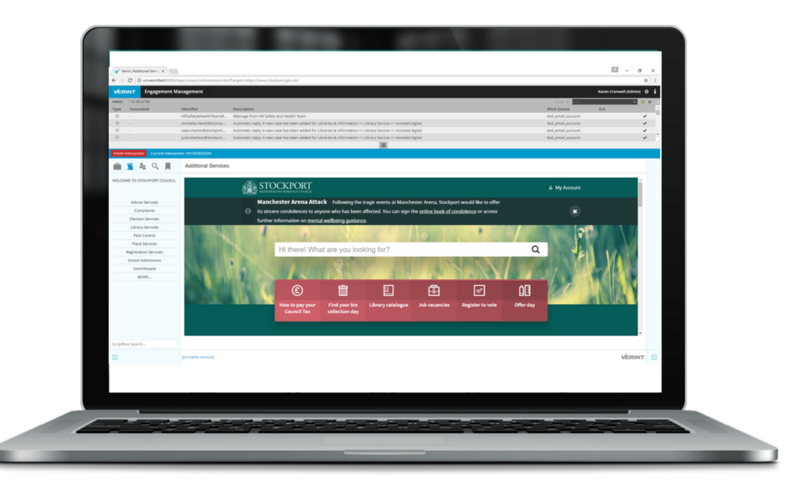 Once a customer’s email address has been added to their contact details, all email interactions with that customer are attached to their case history within the Verint dashboard. 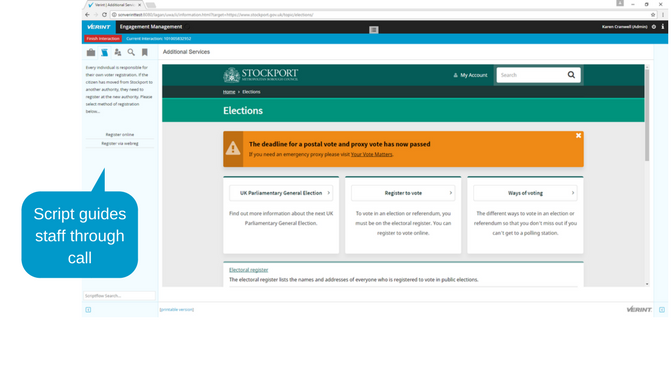 Verint’s easy integration with Outlook also means it is possible to set up service email accounts (such as stockportdirect@stockport.gov.uk) so they can be managed directly from within the dashboard. From the initial point of contact, the inbuilt business rules direct the case to the right work queue or officer, identify the Service Level Agreements for that type of case and can notify officers when responses are due, or managers when responses are overdue, according to the rules defined by the service. 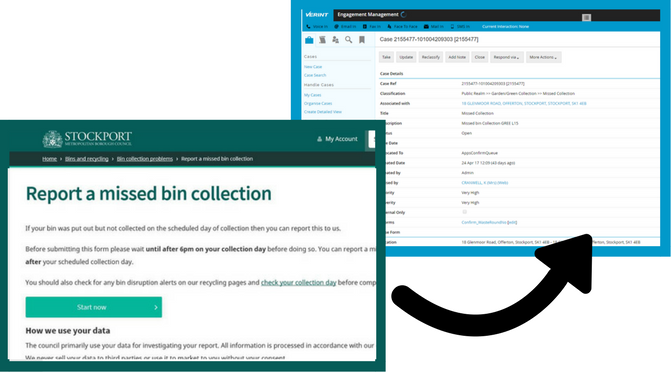 Verint integrates easily with online forms, so when citizens or staff complete a form on the council website, a case is automatically generated within Verint and the job is reported directly to the office doing the work, without the need for involvement by contact centre staff. It’s also quicker for staff to log customer contacts by using a selection of pre-built customer service cases, such as requesting a visit, reporting a fault or registering a complaint. And it’s quicker for IT to build and modify customer service processes making it easier to roll it out to different services. Role based security is in place providing the ability to restrict cases to authorised users only. Access to a Business Intelligence reporting package offers new insights from data to inform decision making.